The MacLeod Laboratory offers a complete Infertility evaluation, treatment for Primary or Secondary Infertility, Recurring Pregnancy Losses and High Risk Pregnancies. We also treat Ovarian Disorders, Menstrual Problems and all aspects of Pelvic Infections in the female and Prostatitis in the male. Our practice is based on solid clinical research, and we report our findings regularly. Below you will find links to our many publications. There’s enough mystery in the science of infertility that entirely dismissing Dr Toth’s talk of lurking chlamydia is difficult – especially if, like Samantha and Kelly, you’re struggling to conceive. It’s easier to endure all those antibiotics than face the fact that your inability to become pregnant might be outside your control. There's enough that we don't know about the science of infertility that entirely dismissing Toth's narrative of lurking chlamydia is difficult—especially if you're among the 10 percent of women in the U.S. who can't conceive. It's easier to endure all those antibiotics than face the fact that your inability to get pregnant might be outside your control. Dr. Attila Toth's thirty years as a practicing infertility specialist and pathologist have convinced him that the only explanation for the alarming infertility rate, so far out of proportion with natural law, is the increasing presence of contaminating bacteria in the genital tracts of both sexes. In this book, he documents how and why this process has escalated so dramatically over the past few decades of increased sexual activity. 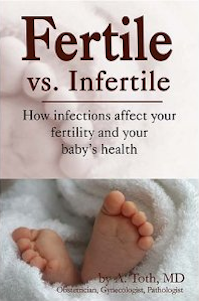 June 2012 Fertility Authority: Extreme Antibiotics as Infertility Treatment?